Eleanor Ruth Duckworth was born in 1935 in Montreal, Canada. Her parents, Jack and Muriel H. Duckworth were Canadian peace workers and community activists. Duckworth studied philosophy as an undergraduate. She received a fellowship to the Sorbonne and during her graduate work there she was a student of Jean Piaget's. She worked with Piaget and Barbel Inhelder, a developmental psychologist, as a Research and Teaching Assistant at the Institut des Sciences de l'Education in Geneva, Switzerland. Her years with Piaget and Inhelder provided the foundation of her work throughout her career. In 1962, at Inhelder's recommendation, Duckworth participated in the Elementary Science Study - a curriculum development and science education reform project in Watertown, MA. The goal of the project was to "put materials into the childrens' hands from the start and help each child investigate through these materials the nature of the world around him". (Elementary Science Study, 1970) Teachers used materials such as bulbs, batteries and butterflies to provide their students with meaningful experiments. Duckworth's goal was to incorporate Piaget's theory and clinical method into the classroom. 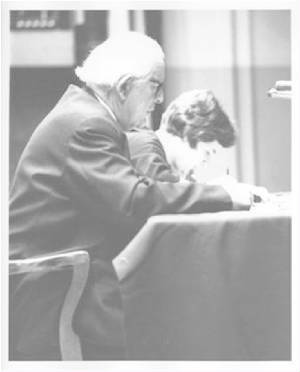 In 1964 Duckworth acted as the translator and interpreter of Piaget at an education conference at Cornell University. The short paper she wrote for the conference "Piaget Rediscovered" was the foundation of the book that came out of the conference, a collection of papers on developmental psychology and curriculum development. The conference and the book it produced were responsible for the renewed interest of the educational community in Piaget's work.